Punjab Govt inflicting insult to great Sikh warrior. An NGO Amritsar Sangarh Committee led by Congress Municipal Councilor Raman Bakshi and former IAS officer K S Kang alleged that present Punjab government inflicting insult to great Sikh warrior Sham Singh Attari by not inaugurating his statue which was completed two years ago. Eulogizing Shaheed (martyr) Sham Singh Attari, NGO official said that he laid down his life in battle along with 140 soldiers to avenge the British to enable us to live with dignity and our great warriors never dreamt that Akali Government led by Parkash Singh Badal would one day would inflict insult to such a great warrior. They claimed that Wagah Indo Pak Border was renamed as Attari because Attari is the birthplace of Sham Singh Attariwala a celebrated general in Maharaja Ranjit Singh's Sikh army. Harprit Singh Sidhu descendent of Sham Singh Attari said that Statue of Sham Singh was completed long back but Punjab Government reluctant for inauguration may be the reason as its construction work was initiated during the regime of Congress Government led by former chief minister Captain Amarinder Singh. 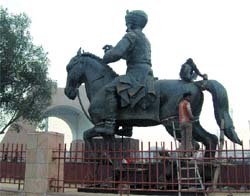 NGO official threatened that on February 10 next year the inauguration of statue of General Sham Singh Attari would be carried out by NGO in the presence of prominent State level Congress leaders if present State Government remain failed to inaugurate in the State level function before February 10 next year. February 10 is the 164 martyr day of general Sham Singh Attari.